Do you want to build a snowman? 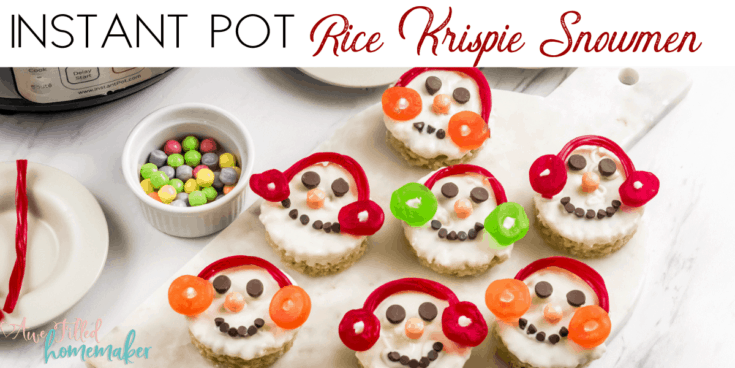 Check out my festive and creative Instant Pot Rice Krispie Snowmen. They are a quick and easy holiday dessert that will dress up your dessert table and light up your kitchen! Or you could make and take for your co-workers, play dates, or even school parties. These treats are adorable and kid friendly. As an added bonus, these snowmen are gluten-free, soy-free and nut free for an allergy friendly Christmas treat. 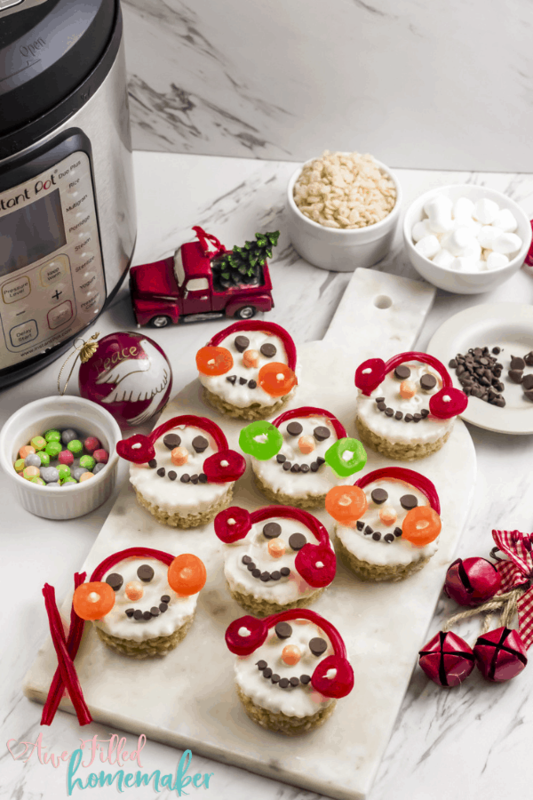 You and your whole family will have a blast decorating and making these Rice Krispies Snowmen treats this Winter. 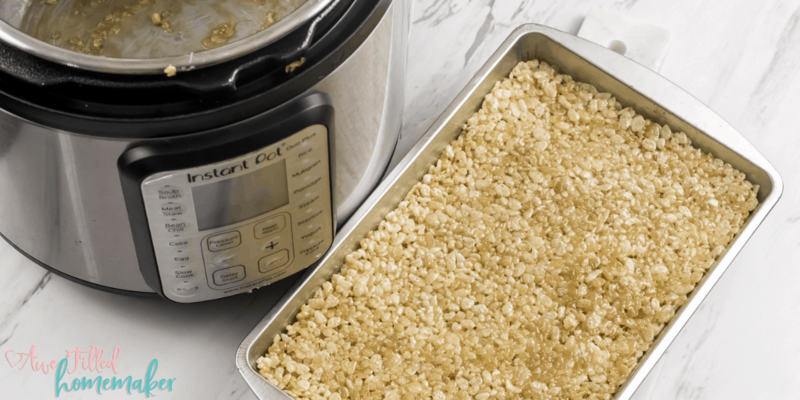 I love making the Rice Krispies in the Instant Pot because it is incredibly simple and the cleanup is quick. 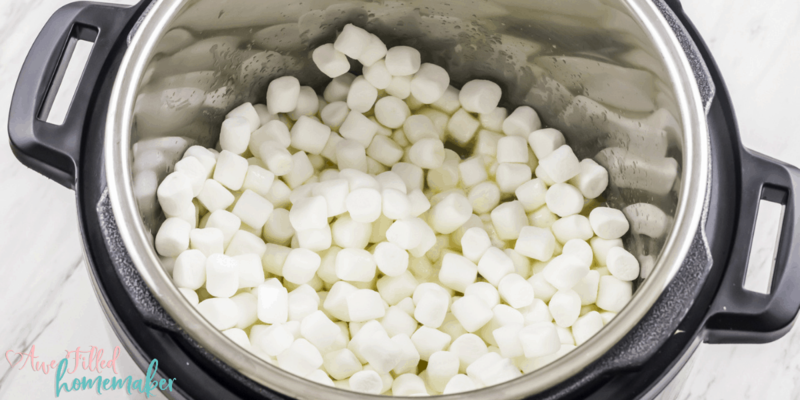 The Instant Pot will melt the butter and marshmallows for an ooey-gooey consistency to pour in cereal and mix. All you have to do is dump the mixture onto your pan and let it sit up. My kids’ favorite part is decorating these treats. The earmuff decoration on these treats is cute and amazing. If you look closely, the earmuffs are made of gummies and licorice! 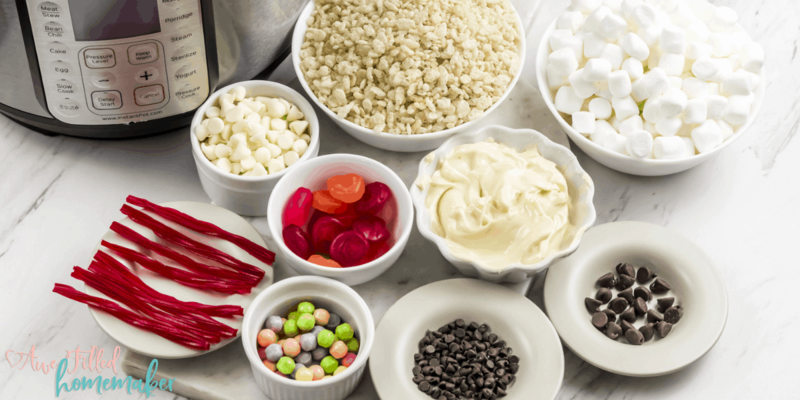 You can see why kids prefer these delicious desserts. If your kids are like mine, they will pick the toppings off one at a time before devouring the rest of the snowman. 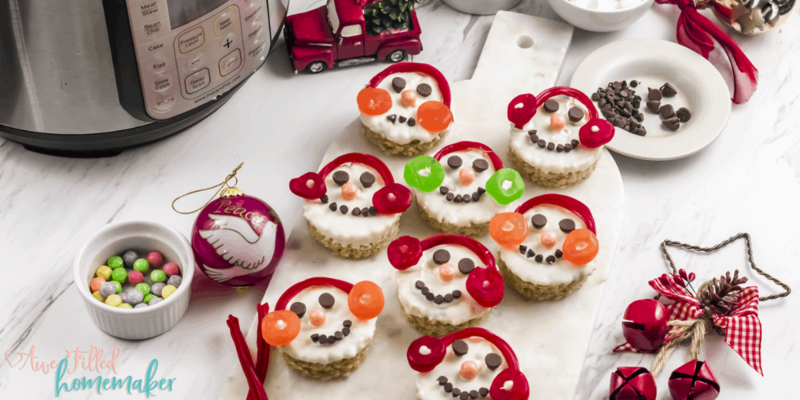 After sharing these delicious treats with the family, continue the fun by making these fun Christmas elves with the kids. As always, I like to include fun facts about the topic. Here are some really fun facts about the classic Rice Krispies treat that we know and love. The first Rice Krispies treat was made in 1939 by two homemakers! The ladies worked to create a treat that could be sold to help raise money for their Campfire Girl troops. Rice Krispie treats are similar in size to that of a brownie. 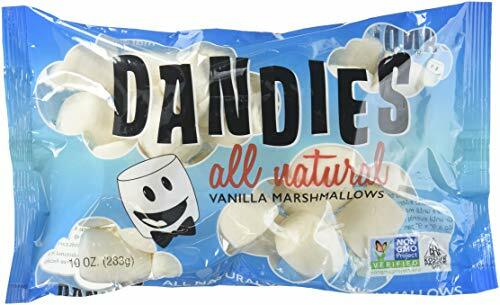 They wanted to create a treat that would match the size of other treats on the market. The biggest Rice Krispies treat is now weighing in at 10,460 pounds! This 5-ton behemoth was created to raise money for a community center in Flintridge, California. In the 1940’s, many reached for Rice Krispies to mail to loved ones because it traveled really well. In 1995, Kellogg’s offered a commercial style Rice Krispies treat to consumers. Grease your pan! I can not stress this enough. If you don’t grease your pan well enough, you will not get your Rice Krispie treats out of the pan without a mess. Use fresh marshmallows. Fresh marshmallows have better consistency when melted as opposed to old or stale marshmallows. Slowly mix in your marshmallows to the melted butter. You want to ensure the butter/marshmallow mixture is consistent throughout. After applying the chocolate, you must work fast in applying the gummies and licorice. The chocolate hardens rather quickly and you will not be able to stick the candies to the chocolate. If the chocolate hardens in the bowl before you apply it to the treat, just warm it up to melt it again. Store in an airtight container once the treats have completely cooled. 1) Generously grease a 9×11 pan with vegan butter. 2) Turn the Instant Pot (IP) on the ‘Sauté’ mode. Allow the IP to heat up for 2 to 3 minutes or until the display shows ‘HOT’. 3) Add the vegan butter and let it melt for a few seconds. 4) Once the butter is melted, add the bag of marshmallow. Keep stirring continuously with a silicone spatula to ensure marshmallows do not burn. 5) Once the marshmallow have melted, switch off the ‘Sauté’ mode and add the rice krispies and mix it well. 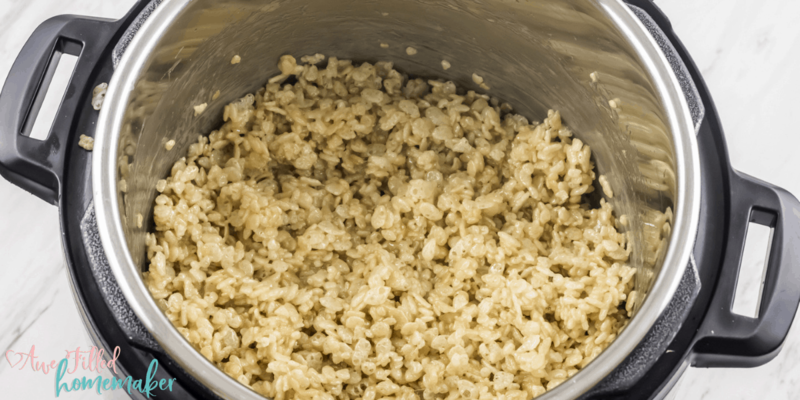 6) Pour the entire pot of the rice krispies mix into the prepared pan. Spread it evenly in the pan and smooth out the top with a greased offset spatula. 7) Let it set for 30 minutes. 8) Meanwhile, cut the Twizzlers in half, lengthwise. Sort out the orange mini chewy from the packet. 9) Using a 2¼ inch circle cutter, cut out 8 circles from the pan of rice krispies treat. 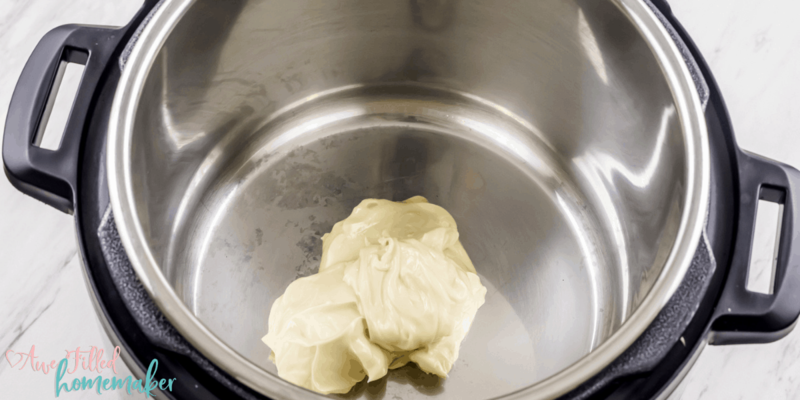 10) Melt the white chocolate in the microwave. 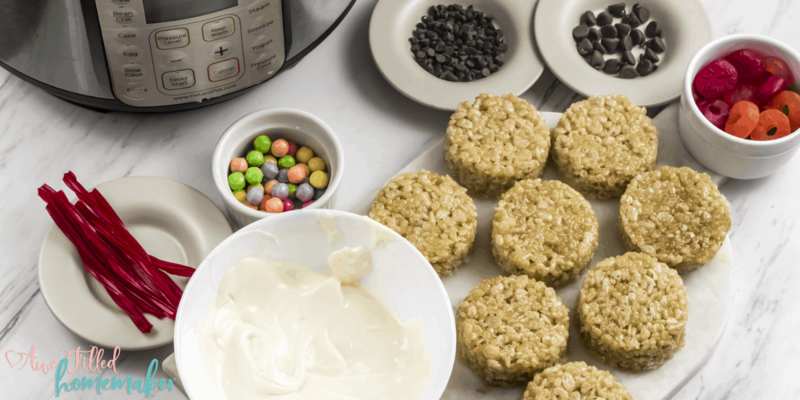 11) Dip the top of each Rice Krispies circle into the melted chocolate. Working very quickly, place a Twizzler half onto the top of each snowman to resemble the top of the ear muffs. 12) With the help of the melted white chocolate, adhere the lifesaver gummies on both sides of the Twizzlers to make the earmuffs. 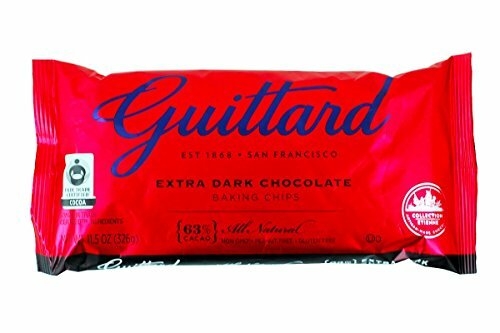 13) Place 2 dark chocolate chips for the eyes and a sweet tart mini chewy for the nose. 14) Make the smile with the mini chocolate chips. 15) The cute snowman is done. Repeat with the rest of the circles. Serve immediately or store in an airtight container. 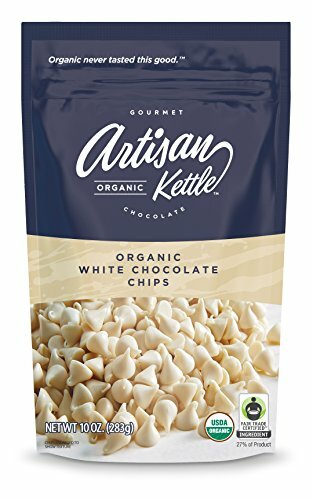 You might have to keep warming the white chocolate as the white chocolate hardens very fast. Also, you need to work very quickly while decorating the snowman’s face. 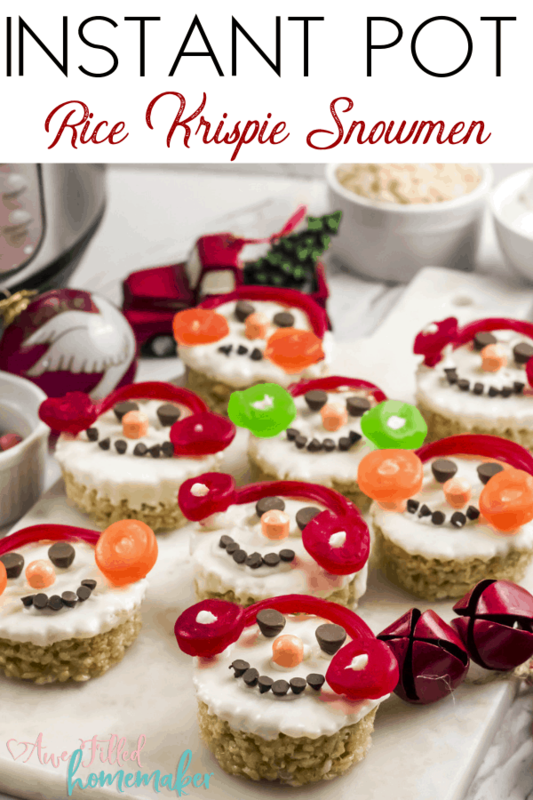 As you can see, these Snowmen Rice Krispie treats are so easy to make. 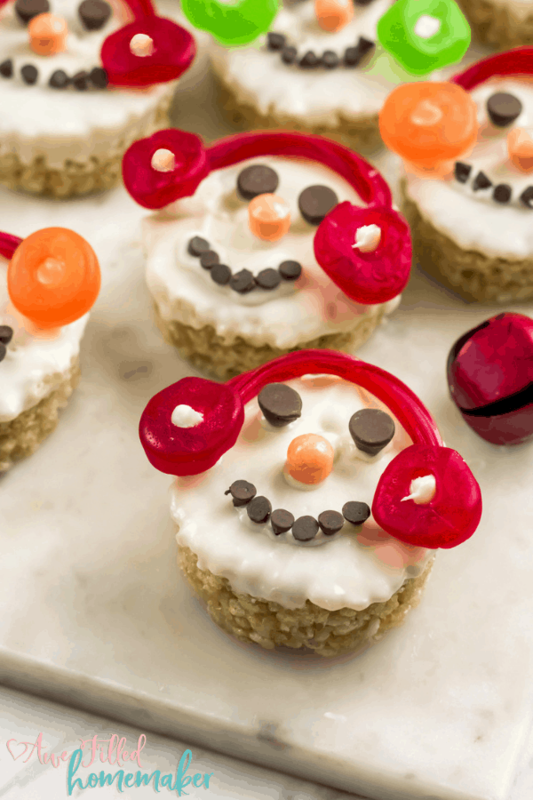 It is a festive way to dress up your treats for the holiday season. Kids will love tossing their aprons on to help. These treats are also great to use for holiday gifts. Wrap each treat individually or put on a platter with other holiday treats and gift to loved ones. A really simple and easy no bake dessert that will fit in with the Christmas season! Before I go, check out the video on my you tube channel. 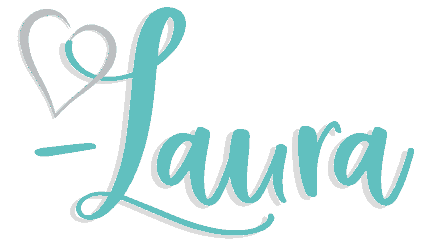 I’d love to have you subscribe there for new videos! Don’t Forget To Print The Recipe Off For Later! Generously grease a 9x11 pan with vegan butter. Add the vegan butter and let it melt for a few seconds. Once the butter is melted, add the bag of marshmallow. Keep stirring continuously with a silicone spatula, so that the marshmallows doesn’t burn. Once the marshmallow have melted, switch off the ‘Sauté’ mode and add the rice krispies and mix it well. 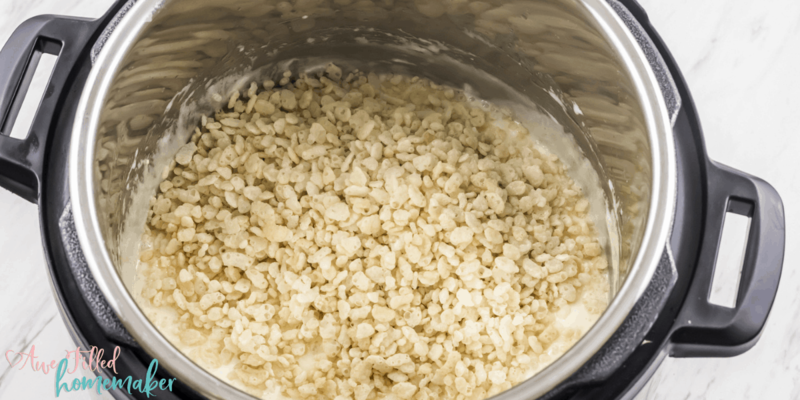 Pour the entire pot of the rice krispies mix into the prepared pan. Spread it evenly in the pan and smooth out the top with a greased offset spatula. Meanwhile, cut the twizzles into half, lengthwise. Sort out the orange mini chewy from the packet. 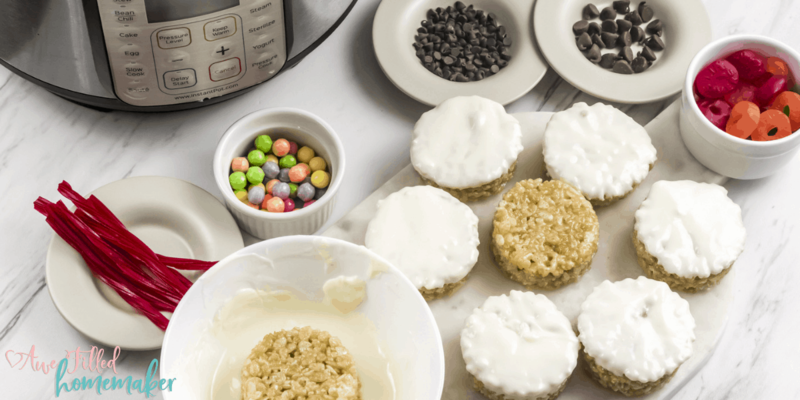 Using a 2¼ inch circle cutter, cut out 8 circles from the pan of rice krispies treat. Dip the top each rice krispies circle into the melted chocolate. Working very quickly place a twizzlers half onto the top of each snowman to resemble the top of ear muffs. 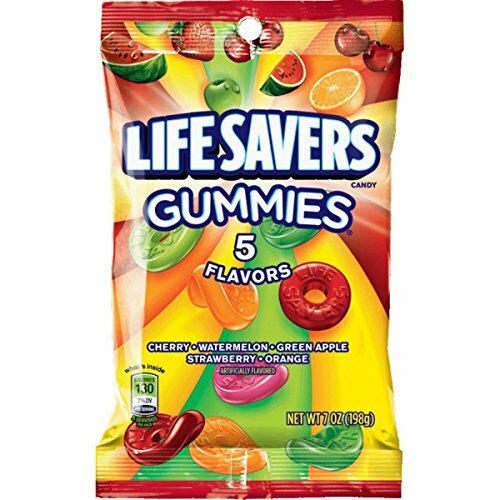 With the help of the melted white chocolate, adhere the lifesaver gummies on both sides of the Twizzlers to make the earmuffs. Place 2 dark chocolate chips for the eyes and a sweet tart mini chewy for the nose. 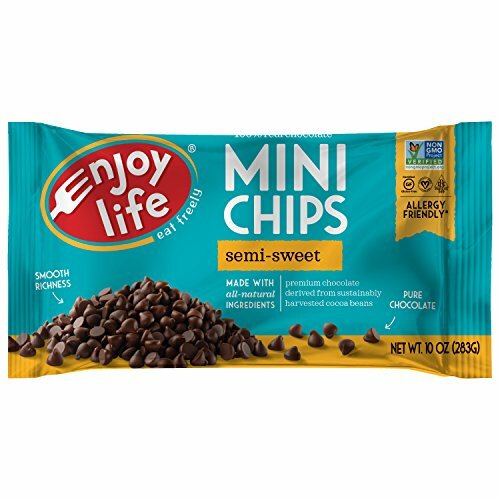 Make the smile with the mini chocolate chips. The cute snowman is done. Repeat with the rest of the circles. Serve immediately or store in an airtight container.